In Minneapolis we are preparing for a long cold night. I opted to start the Dodge up and get her up to temp before I shut it down again for a day, or a week, or whatever. Well, as some of you might have noticed, not much going on in the Dodge world right now. I’ve just gone through a refinance on my home and also have had some less than routine maintenance done on my daily driver. These things have coupled very well(or badly) with the fact that it is just too blisteringly cold outdoors. I hope to start ramping up efforts on the Dodge again in February or so. Yesterday my garage became far less empty with the visit to the parent’s farm. Last night I disassembled one of the carbs I got at the farm and recovered one very important piece that was broken in the car, a float retainer clip. I popped it into the car and gave it a whirl. No noticeable difference in operation, but one less thing broken on the car! 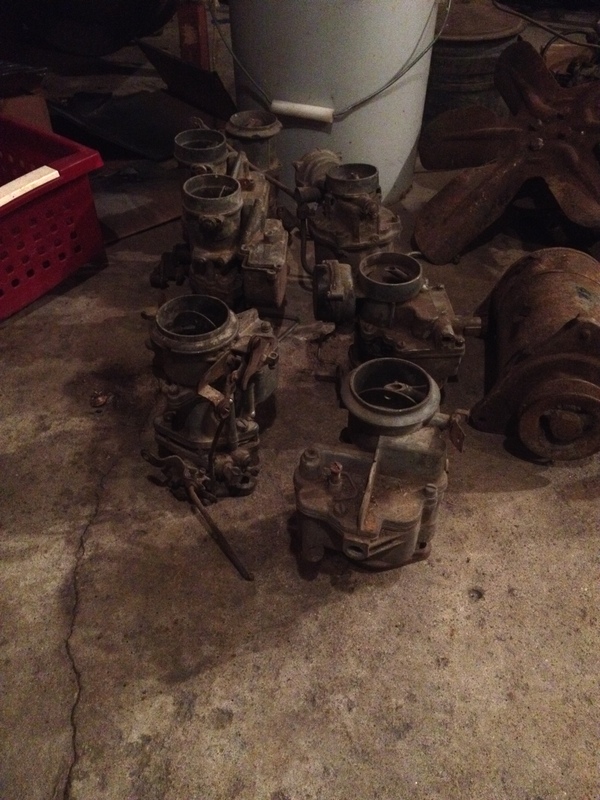 just a couple carbs getting ready for rebuilding or whatever. I went through some other things last night, but I’m still dealing with an annoying cold and found myself tucked into bed at an unusually early hour. 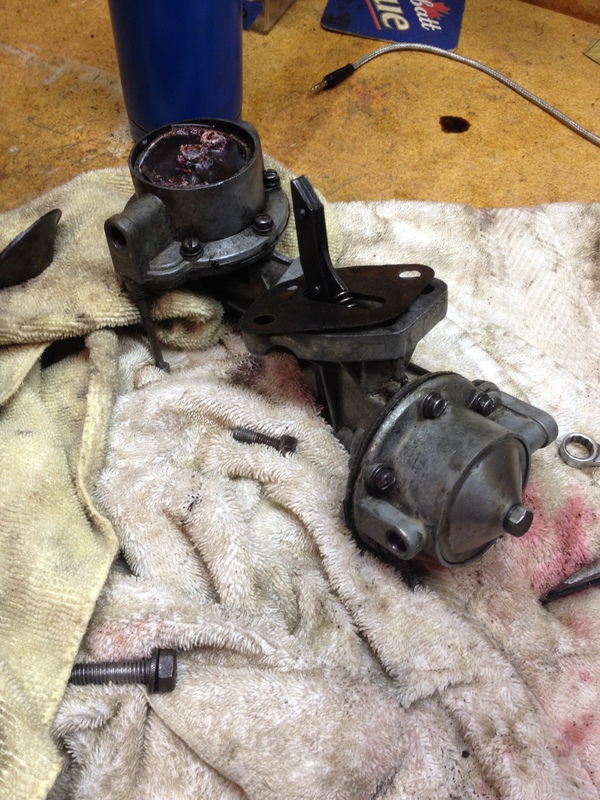 Today, I decided it was time to find a matching fuel pump and replace the one in the 1947. I brought home a box of fuel pumps so the likelihood of me finding an identical replacement was high, so it didn’t take long until I found a match. Box of fuel pumps from who knows how many different automobile manufacturers. I started playing with the box find and felt that it was in reasonable shape and appeared to be in operating condition. Once I got the existing pump off of the car I then started to A/B compare them and noticed that the existing pump actually seemed to operate better. But when I tipped it on it’s side, a ton of debris came out. I then used the box pump as a test dummy and started disassembly. I quickly found out how to clean the Dodge pump of its debris and decided it was still the better of the two, so I put it back in the car, all cleaned up and ready for gasoline. Now, I lack almost all tools required to work on cars, and everything I do have is basically loaner gear from my brother Don, so I measured gas flow using my eyeballs. I have an inline fuel filter hooked up and I would start the engine and look at the flow through the filter to see how much gas went through the filter. Yesterday it was hardly trickling. So tonight I fired up the Dodge and ran to the filter to give it another look. The trickle had turned into a steady flow. Still probably not what I need, but an improvement. My brain tells me that the little inline filter should get completely filled with gasoline, but mine stays half full. I had to shut her off right away because of one last thing today. The engine could really use a rebuild. I’d like to tackle it myself, but not until I have either #1 tons of money or #2 tons of warm space to work on it. I learned that the head gasket leaks water when the engine is cooling down. It’s an old copper gasket, but at the time I felt it was in good shape and I would use it again. I probably should have purchased a new fancy gasket when I put the head back on, but I’ll save that for next time the head comes off. What I did this afternoon was use one of those ‘head gasket in a can’ products. I poured a chunky mixture of copper and string and goop into the radiator and ran the motor in spurts according to the directions. After the whole ordeal was done, the gasket did stop leaking, but I wonder for how long. I also wonder what other side effects the product will have on the cooling system. I don’t find myself particularly concerned though as I should mention again that the engine does need to be rebuilt. So tomorrow afternoon the cure time should be complete for that gasket in a can mumbo jumbo. I’m going to flush the system one more time and fill her up with water to give it a whirl around the block. Actually, I’m going to drive it until I am confident that my fuel starvation problems are still there, or have been solved by my fuel pump cleaning. Then hopefully I’ll shut her off and the only thing that’ll come out of the engine is motor oil. But you can always add more oil. We were at The Farm today. This is the farm our Grandpa Anderson lived at for many years. It’s where the Dodge lived for many years, too. Our parents own the farm now. Mom and Dad had us all down (my two brothers, my nephew, my kids and Donnie’s roommate) to help them out with a bunch of stuff that needed to be done like shoveling gravel around the new shed, burning brush and cleaning out the falling-apart barn. 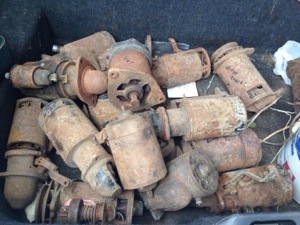 My brothers were digging through the barn and found a treasure trove of Dodge and other car parts including a bunch of old starters and generators. 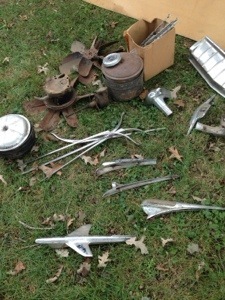 We also found bits of trim, hood ornaments and other parts, some still in original boxes with the instructions inside. The thing that excited me most, though, is a simple visor mirror. Original. Not in perfect shape but oh so awesome. Joel showed it to me and I teared up. Seriously. Why? Well, when we saw the perfect almost all original 1948 Dodge at the Owatonna car show a few weeks ago , the owner took a moment. “Let me show you something really special,” he said. 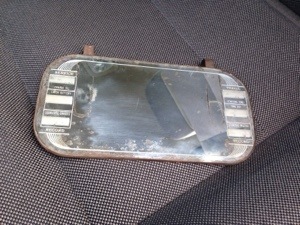 He pulled down the passenger side visor and showed me the visor mirror. I thought it was the coolest thing and immediately wished we could find one for our Dodge. But, knowing such an original gem would be almost impossible to find, I believed having such a mirror would always be a dream. But I was wrong. Grandpa had one tucked away. 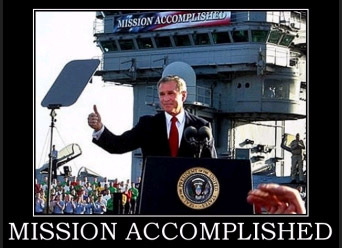 And Joel and Donnie found it. And I am happy. The visor mirror – a treasure! You’ve just got to turn that frown upside-down! That’s a smile, not an upside-down frown! Work on that, too! Gas tank still leaks. That’s just the way it’s gonna be. 66 years of being on this earth is bound to wear most things down. There’s fun to be had under that hood. When I was going through my gas tank drama the other day, the icing on the cake was that a fuel line was leaking by my fuel pump. I didn’t understand why, so tonight I removed it to further investigate. 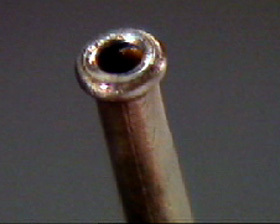 There was two fittings with one piece of cut off metal fuel line, the metal fuel line had a flare at the end which had some distress. I cleaned the surfaces and tried to put everything back together. I blew on the fitting and air came out. I disassembled and tried again. Finally, after some serious wrenching and hammering, i got it air(and hopefully gas) tight. I reattached it to the fuel pump and added an inline fuel filter. Tightened everything back in and stopped that obnoxious little leak dead in its tracks. I went to the parts store to replace the fan belt that Myrna and I picked up last week, as it was the right length but the wrong width. They had to special order it, so not to leave empty handed I purchased some JB Weld. Regular old JB Weld. They sell various other forms and formulas, including gas tank repair forms… but the consistency of straight up JB weld is what I am the most familiar with. I basically coated the entire exposed (and swiss cheese related) corner of the tank with the JB Weld and hoped for a miracle. Now, JB weld is a two part epoxy. 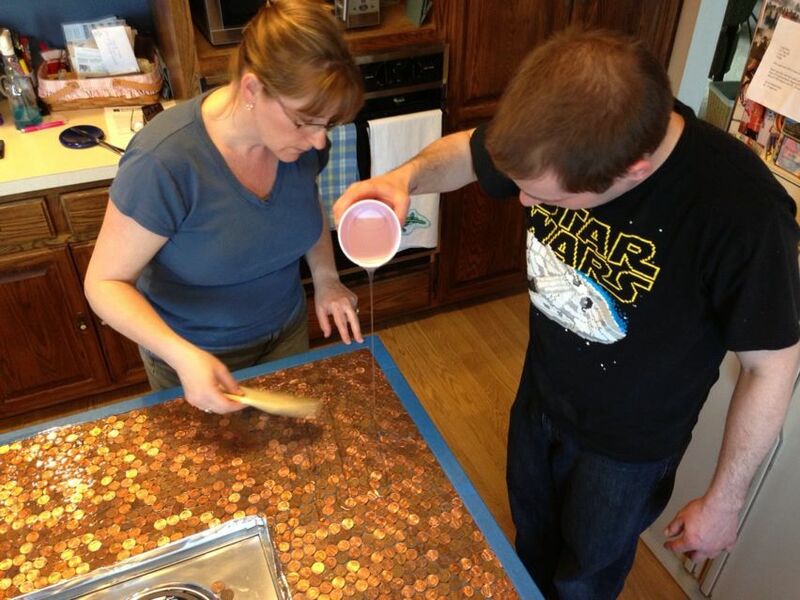 And somewhere in the near future I think I need to go to ‘two part epoxy mixing school’ as my sister can probably attest to. As I don’t always seem to get it right. All you have to do is dispense equal portions of both tubes, mix thoroughly and apply to a surface. 25 minutes later and it should be set, 18 hours later it should be rock solid. Well 2 hours later and the whole darn surface was sticky to the touch. I had to let the old Dodge down off the jack though, so I eased her down and checked the tank for leaks… ok I see leaks… cool, where are they coming from?? Can’t tell, but I sure do have a lot of gas on my facial hair. 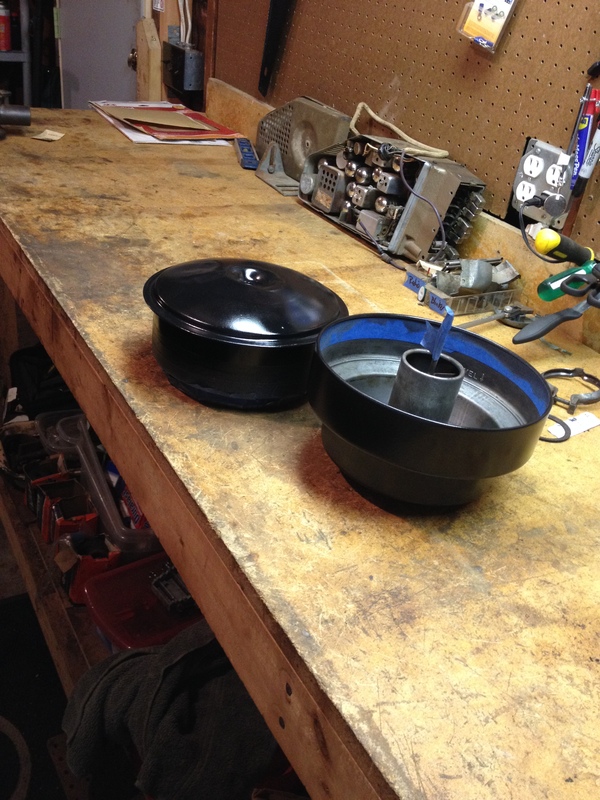 Back on jacks and more JB weld applied…. the waiting continues. So, anways. Good day. I finally did get that fan belt on the car. 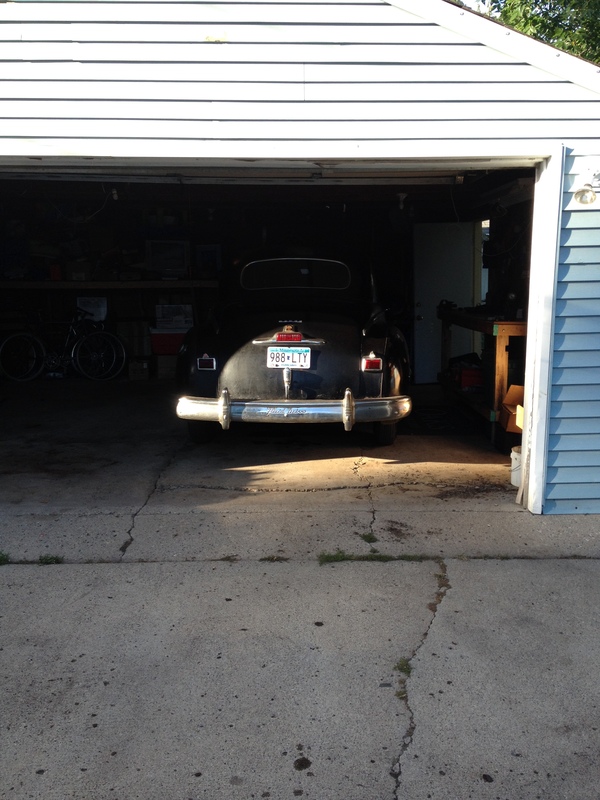 Did get a fuel filter and stop one leak… and the gas tank at least looks cool. 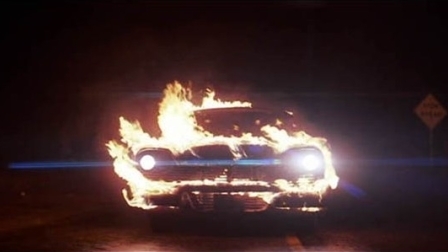 Oh, and all the lights still work. This week had it’s dodge ups and downs. Earlier in the week I got the car licensed and took it for a nice legal afternoon drive. It then started acting up and stalled a few times. I was able to limp it home though, so that was nice. Added some seafoam and gas and called it a day. The next day was spent grinding and painting a few pieces. Air filter box, throttle spring bracket and battery top to be exact. All three look better, but I rushed them all. No biggie, paint can be removed, pieces can be done again. I then decided I needed to service the oil pressure relief valve. It’s stuck in the open position constantly. Well, a solid night of work and I accomplished nothing. Today the siblings stopped by and we mostly just shot the breeze on an excellent Thursday afternoon. 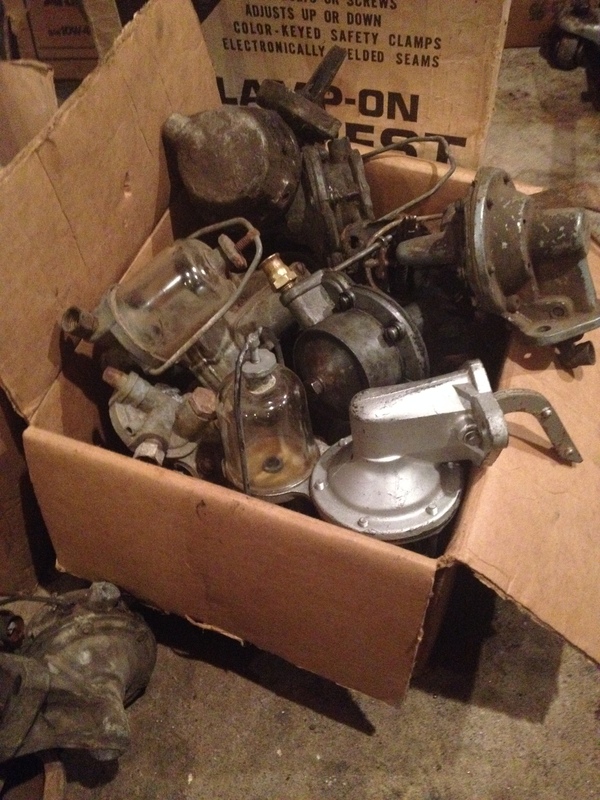 Myrna and I hit the parts store and Donald brought over a box of new old engine parts. I finished off the evening by flushing the oil system and replacing the oil a second time. I sure did get a lot of sludge out. Hopefully in a month I flush it one more time, preferably with a new oil pan gasket and call it a first successful season. Car still needs an excessive amount of love, but my garage isn’t insulated and winters get mighty chilly up here in Minnesota, so I am basically prepping the car for winter right now. Well. 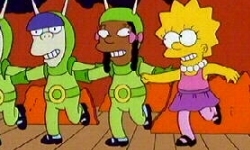 If I do anything else fun, I’ll be sure to tell you. The car doesn’t have collector plates, as this seemed more wise at the time. Freshly painted air filter, probably looking to convert this to an actual paper air filter in the future.